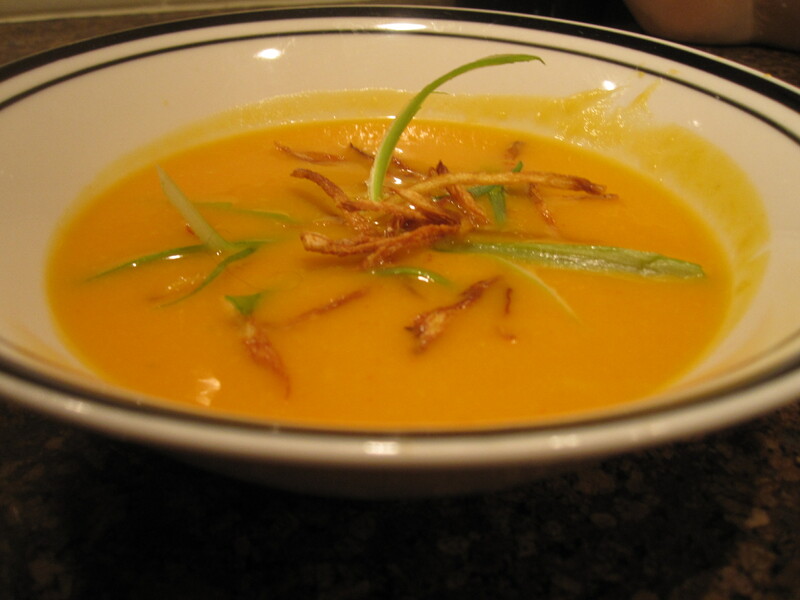 this recipe is one my mom actually made with very little of my help (as in i put the garnish on), but it is a great soup for this time of season so i thought i would share. i can attest to it’s greatness, i have literally been eating this the past week to get rid of it, but after eating for a week and still wanting to write about it, i would say that is pretty good. it is fabulous the day after too. found courtesy of the food & wine magazine. 1. in a large, heavy pot, melt the butter. add the onion and sliced ginger and cook over moderate heat stirring occasionally, until the onion is softened, 7 minutes. add the curry paste and cook, stirring, until fragrant, 2 minutes. add the squash and water and bring to a boil. cover partially and simmer over low heat until soft, 25 minutes. add the coconut milk, lime leaves, and lemongrass, cover partially and simmer for 30 minutes longer. discard the lime leaves and lemongrass. 2. working in batches, puree the soup in a blender; add it to a clean pot. stir in the sugar and lime juice and season with salt. 3. in a medium skillet, heat the oil until shimmering. add the slivered ginger and cook over moderate heat, stirring, until golden brown and crisp, 5 minutes. with a slotted spoon, transfer the ginger to paper towels to drain. 4. reheat the soup; ladle it into bowls. garnish with the fried ginger and scallions and serve.